RECEPTION COME TO THE RESCUE OF THE LOST BEAR! 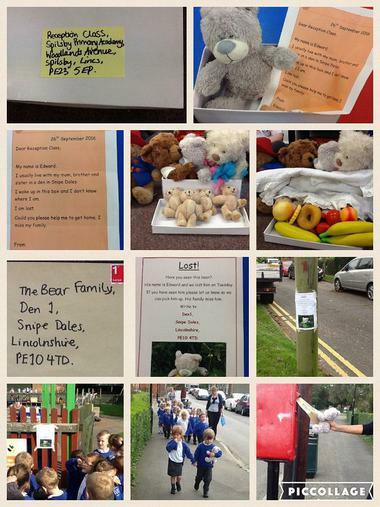 The children found a mystery parcel at school which had a lost bear inside. They kept him safe and warm and fed him. They spotted a lost poster and kindly sent a letter to his Mummy letting him know he was safe and well. Some of the children made things for him, Buddy even made him an aeroplane so he could fly home. Mummy Bear sent them a message, asking them to send Edward back to Snipe Dales with Mrs Bremner, so they put him in her car and said goodbye.